Taifo Mahmud opens the incubator and, picking up the stacked petri dishes one by one, raises them to the light. Each round, lidded container displays a colorful pattern pocked or sprayed across the agar. The researcher points with pride to the branching abstractions of yellows and rusts, oranges and greens, the visible etchings of billions of microscopic bacteria multiplying in his Oregon State University lab. In these microbial colonies collected from the rich, dark soils of Indonesia’s equatorial rainforests, he foresees nothing less than a healthier future for humankind. From them he has isolated compounds that could become the basis for new antibiotics and drugs to fight cancer. “Microorganisms have yielded most of the therapeutic agents that have revolutionized modern medicine,” says Mahmud, a medicinal chemist in the College of Pharmacy who specializes in natural products. “Since the 1940s when soil bacteria were first identified as producers of antibiotic substances, over 10,000 biologically active compounds have been isolated from these organisms, including over 3,000 antibiotics. The microbes in OSU’s Pharmaceutical Science lab, which are undergoing tests or “assays” that will determine their power to heal, originated halfway around the world in one of Earth’s biodiversity hotspots, the Indonesian archipelago curving between the Indian and Pacific oceans. In the steamy jungles of Borneo, Sumatra, Papua and hundreds of the nation’s smaller islands, there are unique ecosystems alive with undiscovered organisms: “black-water” rivers. 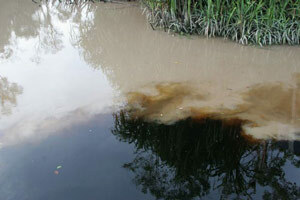 Black water, not to be confused with muddy water, is transparent but tinted, like tea, by tannins leached from peaty soils. Its acid level is like vinegar’s. A native of Indonesia, Mahmud was eager to investigate the pharmaceutical promise of black-water ecosystems. So he reached out to Dwi Andreas Santosa, director of the Indonesian Center for Biodiversity and Biotechnology, in pursuit of samples. Santosa dove in – literally. On Kalimantan (the Indonesian part of Borneo), home of the rare Kalimantan orangutan, Santosa and his research team donned swimsuits to collect soil from the beds of the Pangkoh Lima and Sungai Kala black-water rivers. Since the 750 microorganism samples were delivered to OSU in 2005, Mahmud and his colleagues Mark Zabriskie and Phil Proteau have turned up a number of compounds with the power to fight infections and shrink tumors. As a result, diseases ranging from malaria to melanoma are a little bit closer to being scourges of the past. It seems paradoxical, fighting bacteria with bacteria. Yet scientists have long known that these ubiquitous, single-celled microbes have the power to heal as well as to infect. Their curative properties reside in substances they produce in their natural environment to ward off threats or to communicate with each other. Researchers call these substances “secondary metabolites,” meaning they’re not essential to maintaining life but instead serve secondary functions. Isolating these substances, analyzing their chemical structures and identifying which ones are “bioactive” – potent against infections such as tuberculosis (TB) and malaria or even against cancer – is Mahmud’s life’s work. As a child in Sumatra, Mahmud loved hanging around the clinic where his father practiced medicine. He got to know the TB patients with their hunched postures and rail-thin frames. The dispensary with its bottles of sulfa and tetracycline was as familiar to him as his mother’s kitchen. When time came to choose a career, health care seemed an easy fit. It was his father who steered him toward drug discovery. Here’s another puzzle: Can soil really be a source of health? But making “medicine from dirt,” as one website puts it, isn’t really so outlandish when you remember that penicillin was derived from a fungus. Plants, too, have long been known to have medicinal properties. The hunt for herbal curatives was the focus of Mahmud’s doctoral work at Japan’s Osaka University, where he isolated compounds from potentially bioactive species identified by shamans in rural villages. But plants are bulky. Many pounds of leaves, bark and roots must be collected, dried and transported for laboratory research. Marine invertebrates such as sponges and tunicates are another source of healing compounds. But they, too, are unwieldy. Microbes, in contrast, can fit into minuscule spaces by the millions (a quarter-teaspoon of soil contains about 40 million bacteria). Mahmud likes the practicality of using bacteria. But the work is no less laborious just because the organisms are microscopic. As a practical matter, the lofty quest for a viable drug requires a long, painstaking slog in the lab. To the outsider, Mahmud’s lab is a bewildering jumble of scientific gear. It’s a place where mysterious, multihued liquids in test tubes and flasks are furiously agitated in orbital shakers. Where shelves are jammed with jars of culture media (the agar ingredients on which the bacteria grow) labeled with the names of such familiar nutrients as soy, potato, yeast and malt. Where microbial strains with unpronounceable names are subjected to technical procedures like spectrometry and chromatography. It’s on the posters festooning the laboratory walls where the essence of the research starts to become evident. Diagrams of the microbes’ molecular structures, their honeycombed hexagonal cores and trailing side chains of smaller molecules, are the graphic representations of the lab’s findings. As the isolation and manipulation of these complex chemical structures advances, Mahmud and his colleagues move another step closer to lifesaving breakthroughs. Once a promising anti-infective compound has been isolated, the researchers clone its genetic “backbone” – its structural blueprint – and then manipulate the genes to create improved versions. They also send samples of the compound to the Oregon Translational Research and Drug Development Institute, a public-private signature research center, for more tests. Anti-tumor compounds are sent to the National Cancer Institute for further study. The compound’s chemical properties and structure are also entered into the Natural Products Library, a searchable database. A number of brand-new compounds have turned up in Mahmud’s black-water samples. Among them are six novel metabolites, which the OSU researchers have named “panglimycins” after the river Pangkoh Lima where they were collected. Seven additional new compounds called “limazepines,” a growing group of antitumor antibiotics isolated from soil bacteria, were recently found as well. As described in the Journal of Natural Products and the Journal of Antibiotics, each of the new compounds takes a different form in lab tests – from colorless crystals to yellowish powders, oils or “needles.” Outward color and texture sometimes give clues to underlying molecular structure. Finding novel compounds such as these is just the first step on a long journey to a viable drug – a journey that can take decades. 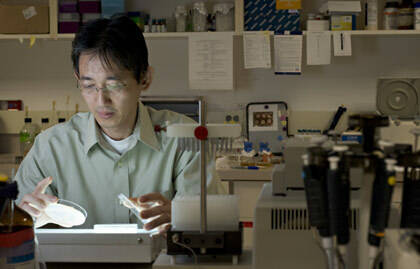 To support the search for new life-saving drugs in the College of Pharmacy, contact the OSU Foundation.